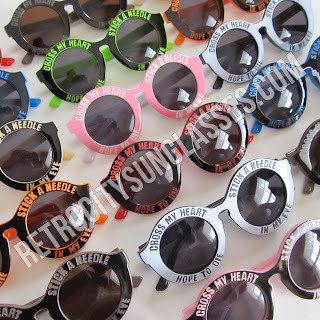 The Round Cross My Heart Sunglasses are positively aDORBS! Don't you agree?And if you get the change to own these majorly cute sunglasses in pink and white or black and pink, then take it! Pink and white Cross My Heart Round Sunglasses are probably the hardest color to find, yet the most sought-after. In general, Round Cross My Heart Sunglasses are totally kawaii, but the pink and white color combo gives it that extra cute edge. For all lovers of "rosy" fashion and anything made by Wild Fox, the pink and white Cross My Heart Round Sunglasses are a dream-come-true. These sunglasses evoke pure California beach-style fashion, due the round frames and cute-saying embossed into the frames!